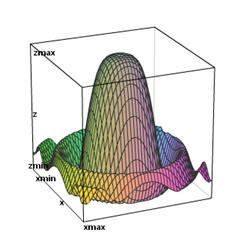 Text: McCallum,Hughes-Hallett, et.al., Multivariable Calculus, 7th Edition, with WileyPLUS. Online Homework: We will use online homework WileyPLUS. Calculators: A graphing calculator is recommended. Instructor: Barbara Kaskosz, Lippit Hall 202J, 874.4445, bkaskosz@uri.edu. Exam 2, Tuesday, Apr 16, in class. Exam 2 covers sections 14.3,14.4,14.5,14.6,14.7,15.1,16.1,16.2,16.3,16.4. Click the picture for a 3D grapher. Class notes (beginning with 13.3). We will be using WileyPLUS online homework system in this course. To sign up for the WileyPLUS system, you will need a WileyPLUS registration code. Make sure that you have a code for the 7th edition of our book. If you buy a copy of our textbook at the URI Bookstore, a registration code for WileyPLUS will be bundled with the book at no additional cost. If you buy a copy of our textbook somewhere else and it does not include WileyPLUS code, you will need to purchase a WileyPLUS code separately from the WileyPLUS site. A code purchased separately gives you access to an electronic version of the textbook, so it is an option to consider. The WileyPLUS website contains instructions, tutorials, technical support etc. 688187 for Section 3, TTH 2pm. The code is also posted on the Wiley flyer posted on your section's Sakai site. There will be two in-class exams during the semester: Exam 1: Tue, Mar 5; Exam 2: Tue, Apr 16. The final exam is scheduled by the Office of Enrollment Services based on the time your section meets: Final Exam Schedule. WileyPLUS Homework -- 100 points. A (93% - 100%), A- (90% - 92%), B+ (87% - 89%), B (82% - 86%), B- (80% - 81%), C+ (77% - 79%), C (72% - 76%), C- (70% - 71%), D+ (67% - 69%), D (60% - 66%), F (0% - 59%). Graphing calculators will be allowed on all exams but not other electronic devices. You should consider your presence and participation in class to be very important to your learning process and ultimately to your success in this course. MTH 243 is a difficult course and you may need help often. There will be much help available during the semester. Your instructor's office hours: TTH 3:15pm-4:45pm, Lippitt 202J. Tutoring at Lippitt: M-TH, 12pm-6pm, Lippitt 206. You will find help at the Academic Enhancement Center. The schedule for Fall 2018 Math Tutoring should be posted soon. Contour Diagram Plotter and 3D Function Grapher Combined Plot contour diagrams of functions of two variables. Draw the 3D graph of same function in and compare the two ways of visualizing functions of two variables. 3D Function Grapher The user enters a formula for f(x,y) and the x and z ranges. Parametric Curves and Motion in 3D The user enters parametric equations for an arbitrary curve in xyz-space. The curve can be traced while the velocity and the acceleration vectors are displayed as well as their approximate values. Parametric Surfaces in Rectangular Coordinates The user enters parametric equations for rectangular coordinates, the applet draws a surface that can be rotated in real time. Parametric Surfaces in Cylindrical Coordinates The user enters parametric equations for cylindrical coordinates. Spherical Coordinates Presented Interactively Become familiar with spherical coordinates. Enjoy many practice problems. Parametric Surfaces in Spherical Coordinates The user enters parametric equations for spherical coordinates. Regions Described by Double Integrals Enter limits in double integrals in rectangular and polar coordinates to see the region described by those limits. Practice finding limits which describe a given region. MTH 243 is a demanding course for students in the STEM disciplines. In order to succeed in this course, you will have to work systematically and hard. In this course we will cover the central topics in the calculus of functions of two and three variables as well as elements of vector analysis. This material is of great importance in engineering, physics, chemistry and other STEM disciplines. Take a look at the syllabus for the list of specific topics: Calendar and Syllabus. During the course you should be able to build proficiency in working with functions of more than one variable as well as vectors and operations on vectors. You will learn about partial and directional derivatives of multivariable functions, gradients, double and triple integrals. You will learn about vector fields and line integrals.